Comedy of masculinity: a wry look at men and masculinity in songs and poems from ‘all men are bastards’ to ‘sometimes it’s hard to be a bloke’ to the plea to ‘tenderise not genderise’ and beyond. 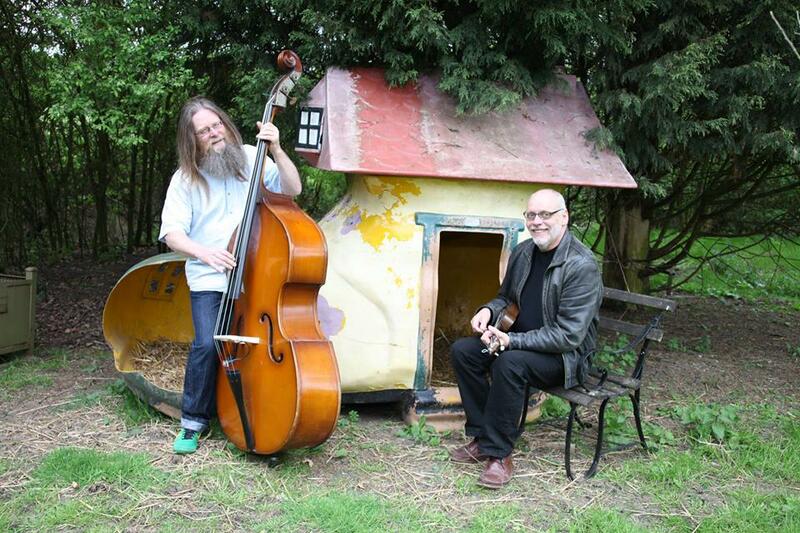 Face Furniture are an acoustic duo, comprised of songwriter and poet Adrian May and double-bass player Murray Griffin. 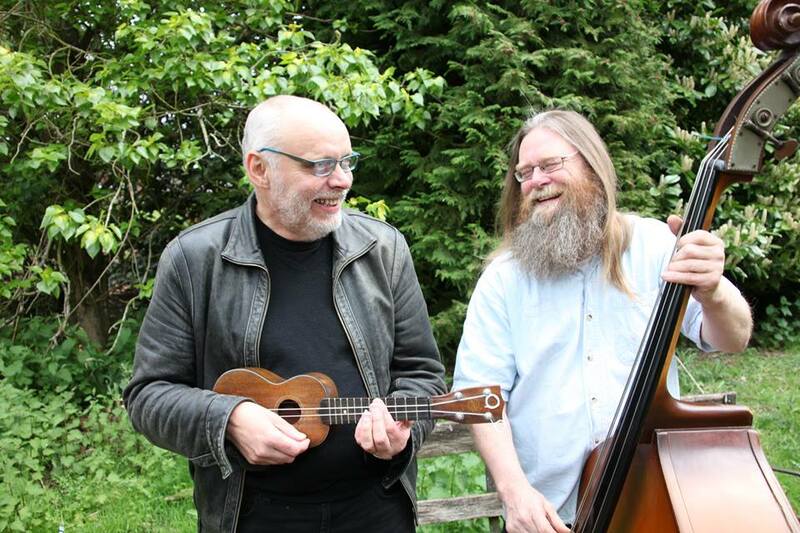 They formed a couple of years ago to record and perform songs and poems from Adrian’s CD and book Comedy of Masculinity. The initial live outings and the reception of the album/ book proved very successful, with appearances in folk and poetry venues, concerts, festivals (literary and music) and even some pubs and bars. With two new complete shows to add to the Comedy …, The Ballad of Brian Bird and John Ball, about the Peasants’ Revolt and Skiffle (!) and their new collection Discovering England (see Shows page), they are forging ahead with more plans, which include 2016’s Sidmouth International Folk Week. For larger gigs, they are often joined by musicians from the first album, John Seabrook on drums and Martin Donald on guitar, under the name Face Furniture and the Extensions. Since forming Face Furniture with Murray Griffin, Adrian May has experienced a renaissance in performing his own songs and poems live. A pioneer of the uke, he has been successful with his serious songs as well as with the comic. Up to the 90s he had performed on the English folk scene solo, as well as in Spring Chickens, The Metric Foot Band, and Eastern Angles Theatre Company. He has written songs for such artists as June Tabor, Adele Anderson of Fascinating Aida and Maggie Holland, and the above bands. For the last few years he has also written many essays on creative writing, song lyrics, as well as Myth and Creative Writing (Routledge) and three collections of poems and lyrics from Wivenbooks: An Essex Attitude, Ballads of Bohemian Essex, and, most recently, Comedy of Masculinity, which includes Face Furniture’s first album of the same title. Murray started playing the bass guitar when he was 13. Along the way he was classically trained trumpet player only to eschew it for rock and roll. He’s probably best known for playing Soul but he’s been in reggae, pop and rock bands. He’s even played with a few people you may have heard of. He is still learning to play the double bass, he can play the electric bass ok but the interface between sport and music, which is the world of double bass, is altogether a different thing. It took most of 20 years to finally persuade Adrian to risk an afternoon of playing together and about 15 minutes to persuade Murray to start a joint project. 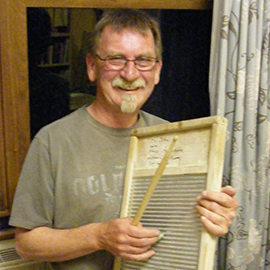 Martin Donald LLCM(TD):A life in music has provided Martin with some unique experiences and memories that have included radio, theatre, touring, writing and teaching plus numerous television shows. He’s had the good fortune to play with many talented artists and in situations as diverse as the QE2 and The Bournemouth Symphony Orchestra. A small selection of highlights have included Jimmy Ruffin, The Drifters, Freddie Cole (Nat’s brother!) Jools Holland, Tom Jones, Bob Monkhouse, Little & Large and many musicals from Cats to Cabaret. Work at The Barbican with The Royal Shakespeare Company, shows with Bob Miller and the Millermen and television on The Frank Skinner show as a Skinnerette show how adaptable he’s been. More recently there have been films with Jesse Eisenberg (The Double) and work with The Honeycombs, celebrating the 50th anniversary of their big success Have I The Right. 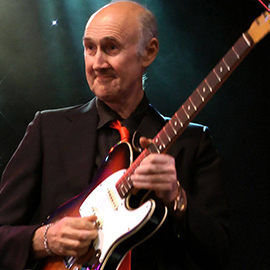 Martin has also been associated with the Registry of Guitar Tutors (RGT) and the London College of Music (LCM) for many years and is a senior examiner for the guitar grades. This includes classical guitar/electric guitar/rock guitar/bass guitar and acoustic guitar, and has involved travelling to many parts of the globe conducting exams and workshops. Teaching some of the amazing young talented artists around at the moment has also been an exciting part of life and has included X Factor winner Matt Cardle. Martin has enjoyed teaching at Felsted School for many years and continues to be part of the thriving musical life there. With a playing career spanning nearly five decades, John Seabrook has built a solid reputation as a talented and eclectic drummer. His early influences from Gene Krupa and Earl Palmer through Al Jackson and Zig Modeliste have contributed, along with many others to a style that combines swaggering backbeats with subtle intonations, all enriched by an ever present syncopation. A veteran of TV,radio and many, many live performances, he can still talk the talk and ,very definitely, walk the walk. John currently lives in the rural wilds of Essex and for relaxation likes to skydive without a parachute. What you can expect from our shenanigans. 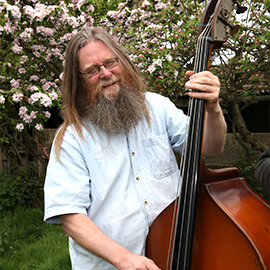 With songs, poems and texts, Face Furniture’s songwriter and poet Adrian May, with double-bassist Murray Griffin, present a tribute to the radical history of Colchester and England through the Reverend Brian Bird, who wrote a book on Skiffle music in the 50s and one on the 1381 Peasant's Revolt leader John Ball. There is also reference to Sydney Carter (another religious protester, author of Lord of The Dance), who wrote a song about Ball and one about Beatnik Vicars. A Lonnie Donegan Gospel number gets an outing and modern evangelicals are teased! As a devotee of English Music Hall, punk, English traditional folk music and multiculturalism that let’s you be yourself, Adrian, with his Face Furniture colleague double-bassist Murray Griffin, presents some ironic and serious takes on being English, where ‘Nobody hates the English (as much as they hate themselves)’! Discovering England will be the title of a new album by Face Furniture and the Extensions. Face Furniture’s first album (accompanying Adrian’s book of the same name) is a collection of songs (and poems) taking a wry look at ‘what it takes to be a man today’. 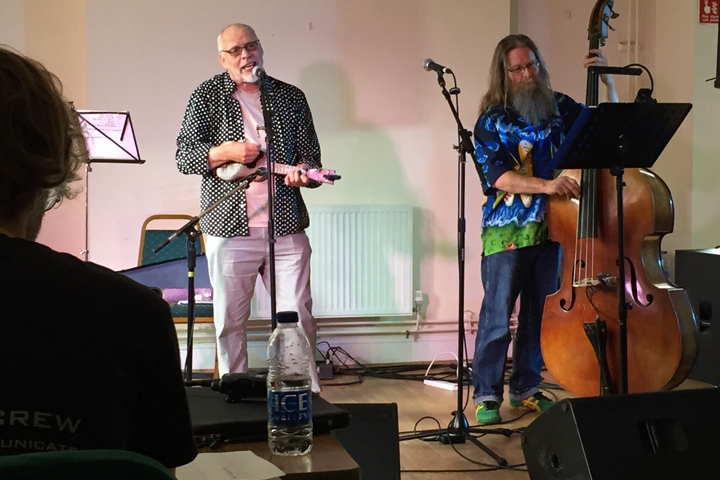 Face Furniture have performed the show’s songs (and a few poems too) at the Essex Book Festival, in Arts Centres, folk clubs, to U3A groups and in village halls, with their full band, Face Furniture and the Extensions. Described as ‘21st Century Music Hall, Face Furniture’s more general gigs (with or without the Extensions) comprise songs from their shows, plus some others from Adrian’s past experience as a songwriter/ performer, both solo and with bands such as Sporing Chickens (where he was the main lyricist) and the Essex traditional folk band Potiphar’s Apprentices. 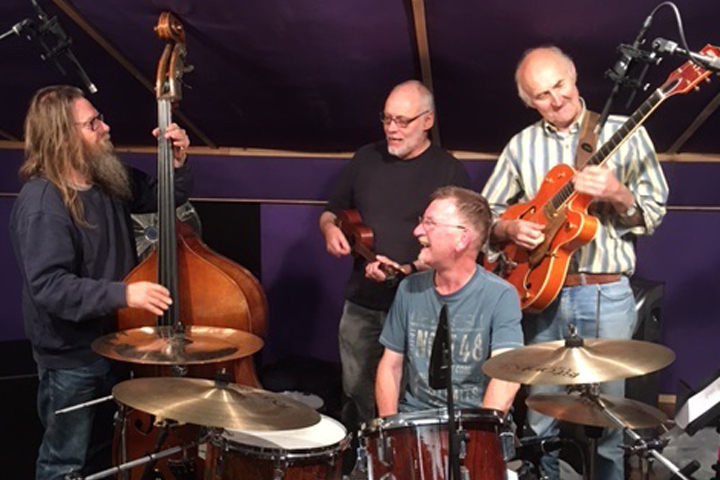 Old a new songs are presented with their characteristic wit, verve and musical flair, accompanied by Murray Griffin’s double-bass and Adrian’s ukes and guitars. Have a listen to our tracks on Soundcloud. Vestibulum ante ipsum primis in faucibus orci luctus et ultrices posuere ced. Etiam ut dui eu nisi lobortis rhoncus ac quis nunc. Surprising nice things people said about us. There exists a new crisis, apparently, concerning of all things our “lost masculinity”. The Chief Scout, Bear Grylls, is to present a TV programme on this subject. The hessian press have been wringing their hands over the matter for some years now, while the tweedier media merely yell, “Man up!” and grumble about our depleted armed forces. This is a review of a CD and a book, although there’s no particular reason to stop there. Adrian May is a performer, and although it says ‘songs and poems’ on the cover of his book, it’s pretty hard to draw a hard and fast distinction between them; poetry, music and performance in both modes seem all to be more or less equally important aspects of his creative practice. I’ve seen him perform, and I’ve made public some words on the subject, but the oddly arbitrary context to which I restrict myself here confines my attentions to the particular objects I have before me. There exists a new crisis, apparently, concerning of all things our “lost masculinity”. The Chief Scout, Bear Grylls, is to present a TV programme on this subject. The hessian press have been wringing their hands over the matter for some years now, while the tweedier media merely yell, “Man up!” and grumble about our depleted armed forces. But who, if anyone, has stolen our masculinity? Boys, traditionally, only used to cry when the football team lost, the dog pegged out, or a favourite racing pigeon didn’t return. Five decades ago many of us never even used deodorants, let alone moisturisers or exfoliants. I bet Roy of the Rovers didn’t have a skin-care regime. As it happens, at that time we were fast approaching the glam rock era and my father’s worst fears weren’t entirely unfounded. “In a glam rock band were you?” they’ll still ask me. “Man and girl.” I reply, as if it had been some sort of alternative national service. The thing is that I’d also worked in factories, in a sawmill and on a farm, so I did have some grounding in basic manliness. To this day, if I’m ever in a van with other chaps, I still have to fight a Pavlovian urge to yell at young women, “Wahay! Awlrite, then, Darlin’?” The only difference nowadays is that the young women now tend to be in their fifties. A crisis of lost manliness, though? Really? 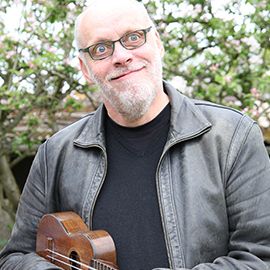 As if on cue, Dr Adrian May, musician, poet and creative writing boffin at the University of Essex, has published a new book, Comedy of Masculinity – a collection of poems and songs with an accompanying CD. As poignant as they are witty, the poems and songs attempt to unravel the mystery of the identity crisis felt by a post-war generation of men now in their 50s and 60s. Caught, as we were between the snarling old bulldog of war behind us and the dragon of social change breathing fire in our faces, we wondered who we were now and what might be our purpose. We could not look to our splenetic, wounded fathers for answers. Yet, many of our girlfriends seemed as baffled by the speed of the change as we ourselves were. Some of us retreated honorably to sheds. Others crept uneasily out of closets. Still more of us, emasculated, maddened or merely embittered, turned to drink or drugs. Many of our recently-emancipated women contemporaries eventually fared little better, Having, post-divorce, to introduce sulky resentful teenage sons to new partners was one thing. Witnessing their teenage daughters reclaiming the make-up, miniskirts and stilettos rejected during their own revolutionary youth, may have been quite another. Decades on, with bridges burned in haste, some of the ex-wives, having missed certain aspects of “unreconstructed” manliness, ran off with the builder, or with a hot-blooded lover encountered on some foreign holiday. Others put on comfortable shoes, giving up on men altogether. Still more returned dissatisfied in late and lonely middle age. England is quietly replete with the unpartnered and battle-scarred veterans of an unwinnable “war” between the sexes. The difference between men and women here, is that it is generally the women who will write the books and reflect upon the subject. Men who attempt such feats, risk being mown down in a media crossfire. On one hand they’ll be derided as reactionary – or just plain wrong. On the other, they’ll be laughed at for being wimps or bedwetters. Here then, is our crisis of masculinity. Dr May, meanwhile, in true Essex balladeer mode, having rugby-tackled the subject in manly fashion has taken his show out on the road. Last week, I watched May and his musical partner, double-bassist Murray Griffin, perform the Comedy of Masculinity show. Billed as Face Furniture and augmented by two music veterans, guitarist Martin Donald and drummer John Seabrook, if I’d expected music with a folk-heavy content, I was mistaken. The mixture of toughness, tenderness and Formby-esque music-hall humour was more like an early New Boots-era Ian Dury gig than anything I’d experienced in recent years. I was profoundly glad that I’d attended. Poetry Wivenhoe had been generous enough to put the show on as a special extra event. 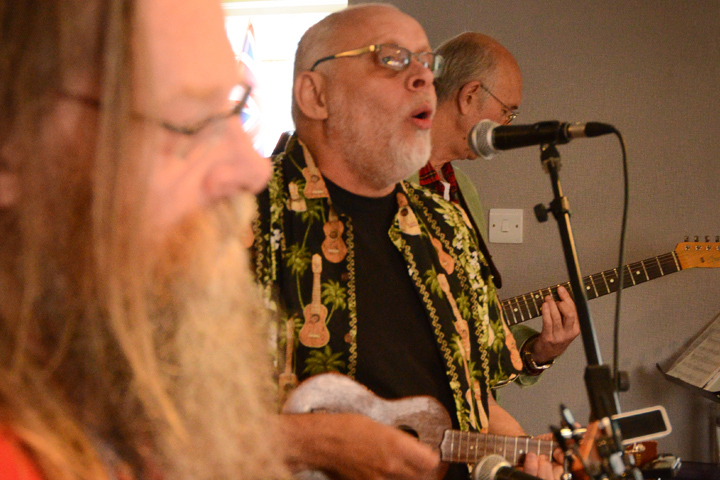 The ramshackle British Legion Hall, which is rapidly becoming the town’s stealth arts centre, was packed. Interestingly, about two thirds of the audience comprised women, let us say, of a cherishable age. Perhaps they wanted at last to hear what a man of their age might say, if such a creature might ever to be permitted to speak. I’m joking, of course. There’s a serious side here. If there really is a “crisis” of lost masculinity, the ramifications concern us all. The chief and abiding fall-out of the so-called War of the Sexes is the very modern scourge of loneliness. Adrian May is a performer, and although it says ‘songs and poems’ on the cover of his book, it’s pretty hard to draw a hard and fast distinction between them; poetry, music and performance in both modes seem all to be more or less equally important aspects of his creative practice. I’ve seen him perform, and I’ve made public some words on the subject, but the oddly arbitrary context to which I restrict myself here confines my attentions to the particular objects I have before me. Ordinarily this would be a CD, with a more or less extensive booklet, and I suppose I could reasonably enough treat the book as a particularly lavish booklet to accompany this album, but that would be a bit of a shame. I don’t think it’s really possible to separate these two artifacts: the CD is no more a freebie or a bonus with the book than the book is a guide to the album. I say this in the light of the specific character of the songs that are collected here, which is to say that they are not poems that have been decorated or ‘set’, any more than when you find them in the book they appear to be lyrics that have been lepidopterologically displayed on the page. A song, as I have argued at length in many reviews, is a whole, whose meanings do not, as it might be tempting to argue, derive equally from its musical and lyrical content in some kind of additive formula, but are to be found exclusively in the conjunction of the two, irreducibly immanent in the experience of listening and understanding. Obviously, to a xenoglot, the musical text will still register as meaningful, as will the lyric if it is read as a poem, and I have to admit that I often neglect to attend closely to lyrics when the music has my whole attention (partly because I’ve been so frequently disappointed by them), but there is a whole world of specific, un-paraphrasable significance to be found in the whole. Why eat a dry roll and some raw mince when you’re being offered a burger? Stylistically, the music on the CD is fairly broad in its focus, although it is all of a rootsy, acoustic character, with a lot of nods towards the commercial entertainments of bygone eras. A bit of jazz, a touch of skiffle, a dash of blues, a loving infusion of music-hall, a generous pinch of folk; and lest you should form the impression that May is a poet who has a bit of an amateur flair for music, he has a sophisticated sense of harmony that draws on the deep, cosmopolitan well of the Great American Songbook, spicing his sequences with well-placed passing chords and chromatic embellishments. This is crucial to the unified rhetorical force of his songs, which turn affective corners in a nuanced counterpoint to their lyrics’ literal meanings; when you read the lyrics in the book (they’re all in there, nestling among the poems like Kinder Surprise Eggs in a box of free-range), you only have partial access to the meanings of the songs. That they don’t seem in any way deficient on the page is an achievement: good poems often don’t work well as lyrics, or vice versa, and that May’s words are able to move seamlessly between these parallel worlds is evidence, not only for their fundamental quality, but for his ability to speak both languages as a native. The arrangements are built largely around May’s guitar or ukulele and Murray Griffin’s double bass, which gives them a broad sonic span, most of which space is not filled in with details, although there are some very tasteful jazz guitar embellishments, some light, crisp drums and a number of other contributions which I won’t start to enumerate, or I’ll have to namecheck everyone who joins them on the album (there are several). May and Griffin constitute a performing duo known as Face Furniture, and it’s very clear from these recordings that their joint practice is the solid foundation on which the CD is built (or is that just me selfishly overrating the importance of bass players? I don’t think so). The other thing that binds the songs to the poems and makes the whole work the singular utterance that it is, is the fact that it addresses itself to a specific set of concerns, around the fraught and disputed territory of gender (as one might have surmised from the title). Again, this is not a piecemeal effort, but a singular engagement with a very broad and various topic. I wouldn’t describe the poems or songs collectively as a ‘cycle’, but you might call the CD a concept album, in a sense decidedly distinct from that term’s usual connotations. There is a unifying theme, which is sometimes metaphorically submerged within the literal surface of the work, as in the heartbreakingly beautiful ‘The Blackbird and The Crow’, but is more frequently comedically direct, as it is in ‘Be A Man Today!’, ‘Soft Men’ and other examples. This strong current of humour is central to May’s writing, enabling him to address ideas that might otherwise be too raw or too worthy to make for comfortable listening, and expressing a warm, inclusive regard for the subjects of his pieces (roughly the whole of humanity, but with a particular focus on the inhabitants of Essex). It’s an unfortunately common cultural habit to regard creative utterances as either serious and profound, or as humorous and satirical; in my view this is a spurious distinction, and I’d argue further that it’s impossible to effectively inhabit one pole without embracing the other. Those who can’t laugh at the world (which obviously includes themselves) are avoiding stuff, but May wears no such blinkers, and is able to offer some resonant insights as a result. There is, in any case, a lot of humour in sexual politics, whichever way you slice them: unintended ironies abound, and May has a bloodhound’s nose for them. At the core of the analysis that informs this work is an appreciation of gender as a cultural construction, whereon hangs the satire – if you think gender’s a given it’s probably very hard to think there’s anything funny about it! May pokes away at many of the cracks in the ideologies of gender, making fun of the narratives through which the masculine and the feminine are constructed, while expressing a wry affection for the people that act as vehicles for those discourses (himself included). ‘(After All He’s) Only A Man’ and ‘Permission To Be Your Fool’, both of which are very overtly comedic songs, seem to be key to the creative thrust of the album, and possibly of the book, although I have to admit I could probably re-read it a couple more times and come to a different conclusion! They explore the irony of male powerlessness, in traditional domestic circumstances, in the aftermath of feminism (for those men that have got the message), or in ‘love’s ritual’; this is a rich source of humour, but it is also pretty painful for many men who have been taught no other means to value themselves (and even more painful for the women who have to deal with the consequences). ‘Man’ is a concept that is almost impossible to extricate from ideas of strength of power without leaving it a crumbling, hollowed-out relic: The Comedy of Masculinity, obscure and self-effacing as it is (and precisely because it is those things), is an important contribution to the project of doing so. It might be argued that we should discard such gender categories entirely, but that’s extremely unlikely to happen. Instead (and if there is a unifying thread to May’s take on masculinity it’s this), the work is a powerful argument for the value of diversity and difference. Masculinity, in these songs and poems, is a slippery fish: it has no simple definition, and to give it one would be to undercut this thesis. Adrian May has understood the lack of an easy answer, and the profound danger of any attempt at a post-modernist flattening of the landscape. The importance of preserving difference in the struggle to eliminate inequality informs every line of this stuff; if there’s a broader idea within which the whole mess of gender can be situated, May seems to believe, it is the value of the specific over the generic. His use of language and music in support of these positions is enviably deft and precise, slipping complex analyses and real wisdom past our cognitive defences on the backs of jokes, melodies and moments of arresting beauty. If only all comedy was this masculine.